Here Are 3 Things We Bet You Didn't Know About Turkish Coffee! 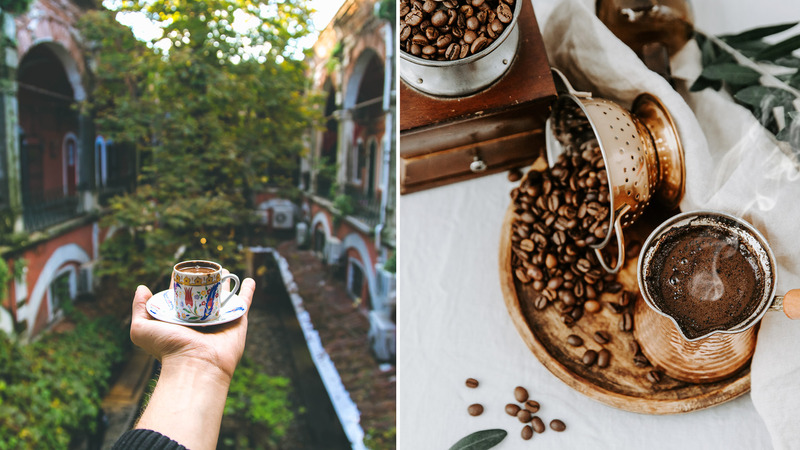 Here Are 3 Things We Bet You Didn’t Know About Turkish Coffee! Frothy on top, gritty at the bottom, and a deliciously strong taste all the way. While many of us have sipped on Turkish coffee, the addictive beverage remains shrouded in mystery and myth. Here are some little-known facts on kahve. Historians assert that Turkish coffee came from Yemen. Sultan Suleiman the Magnificent was introduced to the strong flavours by a governor station in Yemen. But a century later, the drink was outlawed by Sultan Murad IV. Rumour has it that the Sultan dressed as a commoner and roamed the streets of Istanbul, with a sword hidden under his robes, chopping off the heads of those sipping kahve. His successors were lenient, demanding only that repeat offenders be sewn in leather bags and dropped into the Bosporus! Yet the legacy of coffee survived. 2. If Not From Turkey, How Does It Get Its Name? Because the Ottomans popularised the drink and introduced it to the West! While the beans don’t come from Turkey, the name refers to the method of coffee making. The coffee powder is finely grounded and then brought to a boil with sugar and water in a special vessel or the cezve. Just before it starts bubbling, it is poured into little cups called kahve finjani. A coffee house that has been in Istanbul since the 1920’s — Fazil Bey. Or try the locals’ favourite, Mandabatmaz. And if it’s only on your flight back that you realise you haven’t downed a cuppa, there’s Turkish Airlines‘ coffee service where kahve comes served with some traditional halva. P.S: In 2013, Turkish Coffee made it to UNESCO‘s intangible heritage list.